Some time ago, I was contacted to participate in the 'Great Vitarium Bakeoff' held in Australia using the large range of Gluten Free Vitarium products which range from gluten free flour mixes, to packet mix gluten free christmas cakes, instant gluten free mac n cheese for last minute lunches, gluten free crumpets, gluten free batter mix, bread mix and of course jelly. participants were required to bake or cook an original recipe using their products from the range and had the chance to win in up to $20,000.00 worth of prizes - how could I say no? I mean, my gorgeous dark blue kitchen aid is used many, many times a week! I entered my gluten free chocolate mint thins recipe in the flour category and a recipe for gluten free spiked strawberry & lime jellies in the lime jelly category. The Spiked Strawberry & Lime Jellies won the Lime Category!!! I was so excited I did a little dance (or three) around my office! Since then I've actually been busy giving away a lot of the $200 worth of Gluten Free Vitarium products that I won to other gluten free friends in Perth. Plus, one package of gluten free goodies will be posted to an old friend in Melbourne to have some fun with! The hilarity for me with this recipe is that...ummm.... I don't like jelly..... My man has since realised this works to his advantage as this means that the remaining 8packets of gluten free jelly that I haven't given away is going to end up inhis belly, rather than mine, but that's ok I get all the chocolate mousse and cheesecakes! I've kept hold of this little winning recipe till now as they are such festive looking jellies, it just made sense to post them at Christmas time! I hope you all have a safe, happy and not too overindulgent Christmas spent with family and friends. I'll be back in the New Year with some more gluten free recipes - although don't be surprised if they're not too sweet, as after all the melt in your mouth gluten free shortbread my Nan is baking me, I'll be in a gym-eat-less-cake-frenzy! In a blender or food processor, puree the strawberries with the sugar, liqueur and 2 tablespoons of water until smooth. Sieve the strawberries to remove the seeds. Add lemon and set aside. 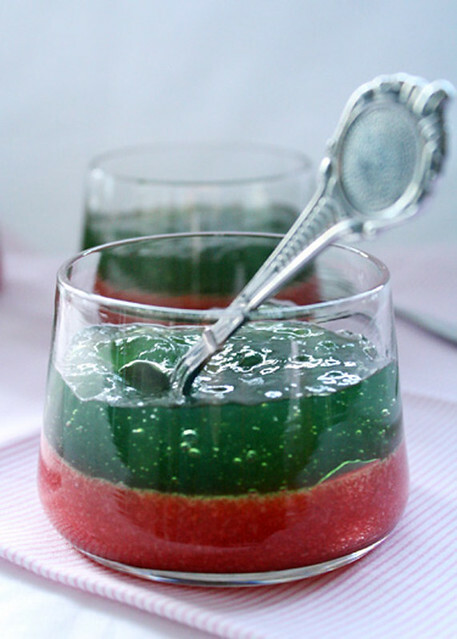 Sprinkle gelatin over a bowl with 2 tablespoons of water. Leave for 5minutes to absorb and dissolve. Heat half the puree strawberries in small pot and add the dissolved gelatine. Stir until dissolved into the strawberries. Mix with the rest of the puree. Pour into small serving glasses. Refrigerate for a minimum of 1 1/2 hours. After 1hour, start making the lime jelly as per packet instructions, adding the midori with the water. Stop at step 3 on the packet instructions. Allow the lime jelly to come back to room temperature for 15-20 minutes or you'll create holes in your strawberry jellies. Spoon over strawberry jelly and refrigerate for at least 2hours or until set. Serve with some fresh strawberries and kiwi fruit on top.